It has been said by many apt communicators that the grand, generalized and often repeated message is the most effective in promoting a given idea; and, that the more flash associated with a given idea the better its ability to make an impression. Whether the product of sturdy pioneers bringing civilization to the wilderness, voyagers descendant from Norman lords or the legacy of a 8,000 year old gathering place, the promoters of various historic narratives in Edmonton often seek to use this tactic to make an impression and garner attention. What’s more, the authors of these narratives also seek to use the results of archaeological work to provide their narratives with added credibility. Despite these pretexts, the results of archaeological work in Edmonton are rarely utilized in the creation of these popular historic narratives because they often do not lend themselves to the support of the grand and fantastic. Rather, much of the archaeological work in Edmonton relates not to the mysterious and creative but to the routine aspects of daily life. These sites express the lives of people in the past that were much like those of yours and mine. To my mind, it is in these modest and routine expressions of daily lives where an understanding of the people that created what we call our heritage can best be found. Three sites recorded as a result of archaeological work carried out in association with the south side of the new Walterdale Bridge provide no better examples of this collective heritage. The most ancient archaeological site recorded and mitigated as part of the Walterdale Bridge Replacement Project is a Prehistoric Period camp site. The site was identified in the fall of 2011 and excavated in the summer of 2012. Radiocarbon dating indicates that it was used approximately 1,500 years ago. Buried two metres below the surface was a hearth feature surrounded by a dense blanket of debris left by the people that stayed there. The concentration of ancient garbage consisted of 3,956 pieces of stone tool making debris, rocks for boiling water and a wide array of bison, rabbit, duck, whitefish and other animal bones. Found within the hearth were carbonized seeds including choke cherry, pin cherry, bunchberry, and kinnikinnick. The latter is well known as a favorite smoke either on its own or mixed with tobacco. Although the site is similar to hundreds already recorded throughout the North Saskatchewan River Valley (and hundreds more waiting to be recorded), the association of the site with specific plants and animals gives us insight into the lives of the people living there archaeologists rarely get. 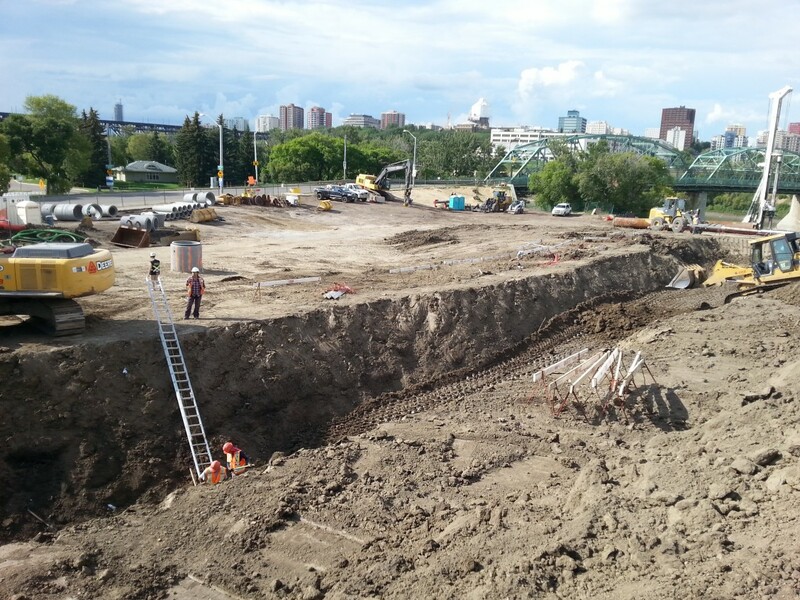 Another archaeological site was discovered during the Walterdale Bridge Project which dates to an important time in Edmonton’s history: the Fur Trade Era. While monitoring excavations for the Walterdale Bridge arch assembly area in the summer of 2014, my colleague Ryan identified the outline of a pit in the wall of the excavation. Filled with mammal and fish bones, the pit also yielded a fragment of a white clay pipe stem. Clay pipes are commonly found at Fur Trade Period sites in Alberta. Nearby, another feature was identified from which a clay pipe bowl, lead shot, trade beads and a broken glass inset trade ring were recovered. The maker’s marks on the pipe bowl and the type of trade ring are common types and have been recovered from Northwest and Hudson’s Bay Company sites from the Rocky Mountains to the Great Lakes. In Alberta, these items have been recorded down river at Fort George and up river at Rocky Mountain House and may date to the early part of the 19th century at the very beginning of the fur trade era in Edmonton. Was this little dump on the south bank of the river left by native traders or free Canadiennes contracting to the Fort to hunt, fish or guide? Maybe one of the many Metis families that visited the Fort to trade or find work. To date these features are the only intact 19th century Fur Trade Period sites in Edmonton to have been recorded outside the area of Fort Edmonton proper. In a third and final example, a Historic Period feature was uncovered during bridge construction. As the foundations for the bridge arches were being built, the south side of the North Saskatchewan River was prepared for the new alignments of Queen Elizabeth Park and Walterdale Hill Roads. Surface grading where these new roads met exposed the old surface of the flood plain and with it a pit dating to the early part of the last century. An aerial photo from AD 1924 shows several houses at this location in the old Walterdale neighborhood, suggesting the feature was likely a backyard garbage pit. The glass bottles recovered from the feature contained medical treatments common at the time including Chamberlain’s Cough Remedy, Bovril, and Dr. Eno’s Fruit Salt. Claiming to cure almost everything, these products were the some of the first to claim success not from their quality but from the impression advertisers could create. The bones of bison, rabbit, duck and whitefish observed in the Prehistoric site are now replaced by cow, pig and chicken and the seeds of apples, raspberries and cultivated vegetables were recovered with them. Perhaps a workers family from John Walter’s lumber yard across the road left this more familiar garbage. The discarded china doll indicates the presence of a child. Was the toy dropped and broken, or cast aside through lack of interest? Each of these sites relate not to the mysterious and creative but to the routine and common. They speak to the lives of individual people and the times in which they lived. Although their lives may not be reflected in the grand historic narratives often promoted, it’s exciting that it is possible to recover this evidence at all. These three sites were found all within a few dozen metres of each other at a location where people today create their own stories by walking, riding their bikes, jogging with strollers and awaiting the new Walterdale Bridge. The great promise of archaeology is that through these modest and routine expressions of people’s lives we can see ourselves. It’s the work of the berry picker 1,500 years ago, the trader 200 years ago, and lumber yard worker one hundred years ago from which communities like Edmonton are built. Although you don’t get to pick and choose, the depth of information and the detail afforded by archaeological research is by far more interesting than the mystery and creativity of the promoter. It’s my hope that in the future the stories of these mysteries of Edmonton’s heritage are given their place and we find the creativity to place ourselves alongside them. Gareth has worked as a private consulting archaeologist since 1999. In 2008, he formed Turtle Island Cultural Resources Management, a consulting firm providing archaeological, paleontological, historic and aboriginal traditional resource management services. He has provided cultural resource management on the Rossdale Flats since 2007 and is the cultural resource management lead for the Walterdale Bridge Replacement Project.